NASA's Mars rover Curiosity has left its landing site, embarking upon a weeks-long Martian road trip toward its first major science target, mission officials announced today (Aug. 29). Curiosity headed off eastward Tuesday (Aug. 28) toward a spot called Glenelg, where three different types of terrain come together in one place. The 52-foot (16-meter) drive marks the rover's first big move away from "Bradbury Landing," where Curiosity touched down on the night of Aug. 5. 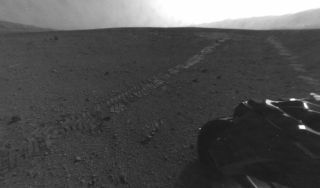 "This drive really begins our journey toward the first major driving destination, Glenelg, and it's nice to see some Martian soil on our wheels," mission manager Arthur Amador, of NASA's Jet Propulsion Laboratory in Pasadena, Calif., said in a statement. "The drive went beautifully, just as our rover planners designed it." Martian dirt clings to the wheels of NASA's Curiosity rover in this photo taken Aug. 28, 2012, after the rover's first long drive, a 52-foot trek. Glenelg is about 1,300 feet (400 m) away, so it'll take Curiosity a while to get there, especially since researchers plan to make some stops along the way. The rover's stay at Glenelg promises to be even longer. Mission scientists are eager to study the diverse set of geological formations at the site, and they will likely use Curiosity's drill — which can bore 1 inch (2.5 centimeters) into solid rock — there for the first time. This image from NASA's Mars Reconnaissance Orbiter shows the Curiosity rover landing and destinations scientists want to investigate. The rover's first driving target is the region marked by a blue dot that is nicknamed Glenelg. Released Aug. 17, 2012. The $2.5 billion Curiosity rover landed Aug. 5 inside Mars' huge Gale Crater, tasked with determining if the area could ever have supported microbial life. The 1-ton robot carries 10 science instruments to help it answer this question. While Curiosity will spend a fair chunk of time at Glenelg, its main science target is the base of Mount Sharp, the 3.4-mile-high (5.5-kilometer) mountain rising from Gale Crater's center. Mars-orbiting spacecraft have spotted mineral evidence that Mount Sharp's foothills were exposed to liquid water long ago. Curiosity may be ready to start the 6-mile (10-km) trek toward Mount Sharp's interesting deposits by the end of the year, Grotzinger has said, though he stressed that timeline is speculative.